Our walk of Sunday 23 November 2014 takes place at the Mahairas mountain area. We follow a well-marked trail, which starts outside Politiko village on a steady gentle climb that takes us to Mahairas Monastery and the site of the sacrifice of hero Grigoris Afxentiou in 1957. We follow the same path downhill to return. The total distance (to and fro) is 11 km. The walk will take 4 hours and is of medium difficulty. The walk will allow time to visit both the Afxentiou monument and the Monastery. The walk starts at 11:00 am. Xenophon is leading this walk, which will go ahead even in light rain; if you need to, call 97613720. For the initial 50 minutes the walk is on the left bank of the Pedieos river; we then cross over to the right bank. There is a rich variety of plants in our path, including the endemic cyclamen cyprius (it flowers from September to January), golden oaks, lavenders, orchids, crocus, asphodels. About lunch: Sadly, there is no taverna on a long radius from the walk start, neither in any of the neighboring villages on the way back. Consequently, Strollers are advised to bring along their lunch (sandwiches, fruit, snacks etc), which we shall eat in a picnic style at the Monastery. How to get to the walk start: Get to the round-about next to the Presidential Palace. From downtown Nicosia you reach this along the Kyriakou Matsi avenue or along the D. Severi avenue. Set your odometer to zero on the round-about and drive along the principal road towards Strovolos and then Lakatamia. At the 4.2 km reading you reach the main crossing with the major bypass road (named Spyrou Kyprianou avenue) linking Makedonitissa on your right with the Nicosia-Limassol highway on your left. This is the popular by-pass road which drives past the Jumbo toy store and the American Heart hospital. Traffic coming from the Presidential Palace can follow the tunnel that dives under this main crossing. There is a large Metro super market on your left at this main crossing, as well. Set your odometer to zero at this main crossing and continue straight, towards Lakatamia. At the 1.5 km reading you drive past the very large church of Agia Paraskevi on your right hand side. At the 1.9 km reading you reach a round-about. Take the 3rd exit, which is at right angles to your right. At the 2.1 km reading you drive past a Lidl supermarket on your left hand side. At the 2.6 km reading you reach traffic lights (the first traffic lights after the round-about). There is a Papa John’s pizza house at the corner on your right. Turn left at the traffic lights, following the sign towards Mahairas. You drive straight along this main road (E902) for several km, going through the villages of Lakatamia, then Deftera, then Psimolophou, then Pera Oreinis. How to get back to the principal road to Nicosia, from the walk finish: Set your odometer to zero at the start of the return trip. Do an about turn and drive back the way you came. At the 2.1 km reading continue straight (ignore a side road to the right signposted to ‘Agia Skepi and Philani area’. At the 7.0 km reading you get to a round-about, turn left. At the 8.3 km reading you pass a bridge, with a large church on your left. At the 8.5 km reading you reach a T-junction where you take a right turn. At the 8.7 km reading you turn left into a side road; there is a road sign to Nicosia here. At the 9.1 km reading you reach a T-junction where you take a left turn. You are now on the principal road (E902) that will take you back to Nicosia. About Mahairas Monastery: Mahairas Monastery is situated at an altitude of 870 metres on the slopes of Mount Kionia in a picturesque depression of the Mahairas Mountains. It houses the miraculous icon of Panagia of Mahairas. Legend has it that an unknown hermit brought the icon to Cyprus secretly from Asia Minor during the years of iconoclasm (persecution of icons, 8th – 9th centuries). The hermit resorted to a cave on the mountains of Mahairas. After his death, the holy icon remained there until around 1145, when blessed with divine grace, the hermits Neophytos and Ignatios reached the spot and found the cave covered with bushes. In order to approach the icon, the two hermits had to cut the bushes with the help of a knife given to them by divine hand. Thus, the icon took the name ‘Mahairiotissa’ (the word mahairi in Greek means knife) or, more simply, of Mahaira. 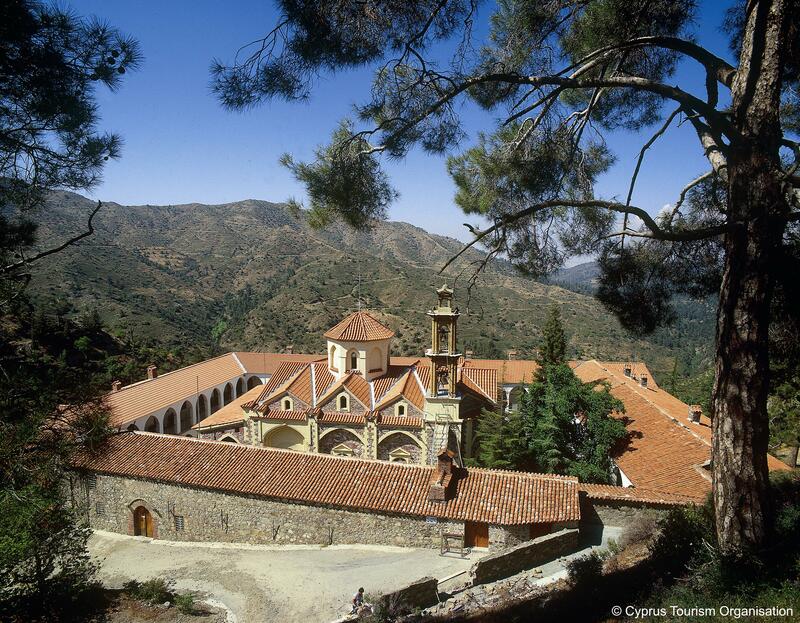 The monastery was later built on the same spot and is one of three Cyprus monasteries that remain under the Patriarch’s jurisdiction. The brotherhood is extremely devout, keeping vows as strict as those of Mount Athos in Greece. The monastery of Mahairas is owner of large estates of land, acquired from donations during the Lusignan/ Frankish era (1192 – 1489 AD). The three – nave church of the monastery was built between 1892 and 1900. Its wood – carved iconostasis was made in 1919 -1921. The bell tower is 19 metres high and dates to 1900. No photos or video – cameras are allowed within the monastery area. About Grigoris Afxentiou: Grigoris Afxentiou is the pre-eminent hero of the EOKA struggle of 1955-1959 to liberate Cyprus from British colonial rule and unite the island with Greece. Afxentiou was born in the village of Lysi in Famagusta district (since 1974 under Turkish occupation) in 1928 and killed in the Battle of Mahairas on 3 March 1957, after his hideout was tipped-off by a traitor.